A sign of friendship now welcomes visitors to Alaska's largest city. A 17-foot spruce pole shaped in Anchorage by carvers from the Sakha Republic in Russia went up Saturday during an afternoon ceremony near the "Welcome to Anchorage" sign along Fifth Avenue near downtown. Fairview resident Paul Fuhs helped coordinate the project, which he says is a continuation of more than two decades of friendship between the two regions. 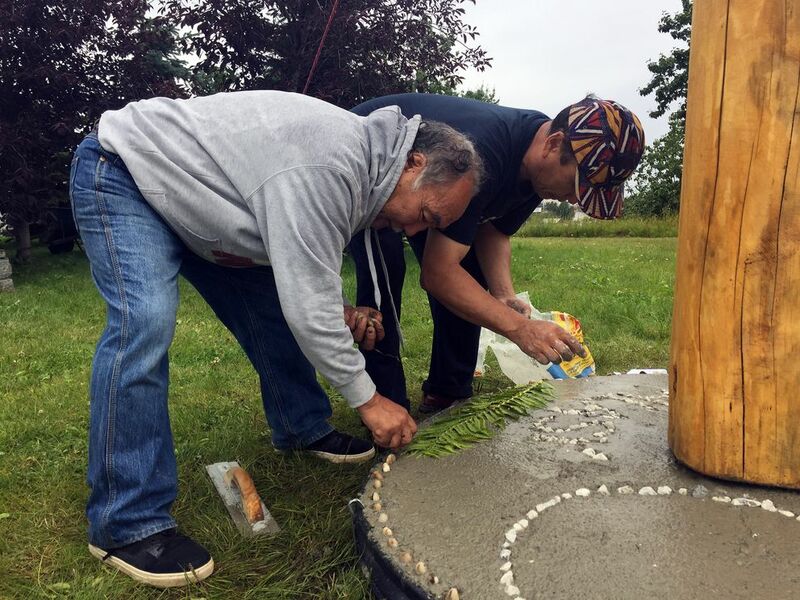 "I'm one that believes we ought to have good relations with them regardless of what's happening nationally or internationally," Fuhs said Saturday as a trio of carvers (and Fuhs' daughter, Hazel) put the finishing touches on the base of the pole. Fuhs said Mayor Ethan Berkowitz was in attendance for a small blessing ceremony Saturday. The raising of the pole roughly coincided with the 23rd Russian American Pacific Partnership, an annual business and government conference held July 25-26 in Anchorage. The project was overseen by Mikhail Ershov and his fellow master carvers Villiam Iakovlev and Iurii Grigorievich. The pole is a traditional "serge," which Fuhs said is used by the Sakha (or Yakut) people to tie off their horses and as a traditional symbol of welcoming and friendship. "You tie your horse to it, come in and have a cup of tea," he said. But the serge also has symbolic meaning to the Yakut people, according to the Gualala Arts Center in Northern California, where an Ershov-led group of carvers placed a serge during the 2014 Sakha Culture Festival. According to the center, the serge "has deeper meanings as a symbol of life, people's spirit, connection between generations, and a sacred symbol as a world tree or tree of life." Fuhs has maintained close relationships with Russia dating back to his time in the 1980s as mayor of Unalaska/Dutch Harbor. The former Alaska commerce commissioner and member of the Russian American Pacific Partnership said he's probably traveled to Russia 30 times and thinks the two regions have much to offer each other. "It's a nice friendship," he said. The spruce tree for the serge was harvested near Indian and took five days to carve. The top features the image of two horses, animals that have special significance to people of the sparsely populated region in northeast Asia. The base is made of cement, with impressions of fern leaves as well as the words "Alaska" and "Yakutia" and an image of a horse and the Big Dipper cast in rocks. Fuhs said the location near Merrill Field was chosen after talks with the city and airport, which controls the plot of land near the highway. He said the site where people first enter downtown via the Glenn Highway made perfect sense. "This is a welcoming place," he said.